Test early game ideas and prototypes. Like X-Ray Goggle training missions, hack mazes, and hackable comic books. Brainstorm totally new ideas. Have them surprise us with cool stuff we’ve never thought of. Stage a mini dress rehearsal for what we want to do on a larger scale at the Mozilla Festival. Bringing kids, game designers and developers together in London for Hackasaurus design jams and hack sprints this November. 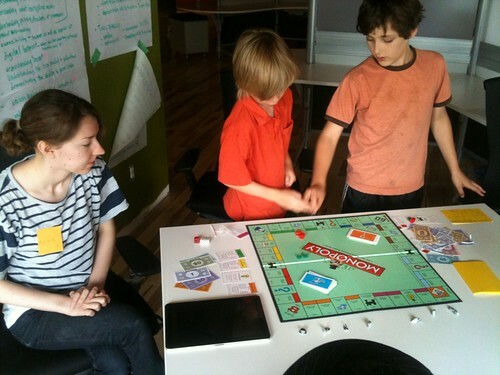 To get warmed up and into the spirit of the thing, Jess had the kids start by hacking some traditional board games. 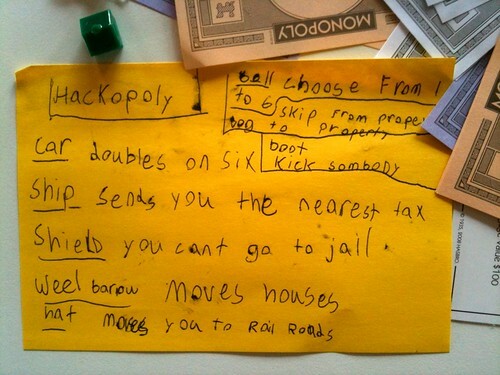 Kids hacked and reinvented some traditional board games -- like Snakes and Ladders, Monopoly and chess -- changing the rules and game mechanics to make them more fun. 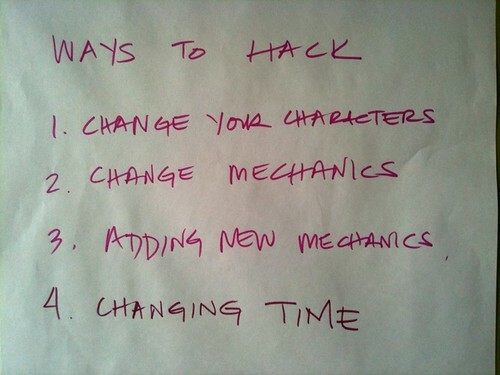 Ways to hack traditional games. The kids came up with a fifth: adding narrative and back story. In this version, each game piece has unique powers. Next we tested some early game prototypes for the X-Ray Goggles. Like Atul’s “Parable of the Hackasaurus,”and an early bare-bones “hack maze” prototype Dan Mosedale and David Humphrey put together. In both cases, players are given a “broken” page and then use the X-Ray Goggles to fix it using simple HTML. Tristan uses the X-Ray Goggles to fix broken elements on the page. The page responds in real time, counting down the number of elements left to fix. A “hackable comic book” group. Working on illustrations and early narrative for an interactive comic-book style experience using the X-Ray Goggles. A “build your own game using Scratch” group. Thinking about how you might incorporate the X-Ray Goggles into the gameplay. A “hack maze” group. Working on how to create “Portal”-style games where users create and share their own hack mazes. 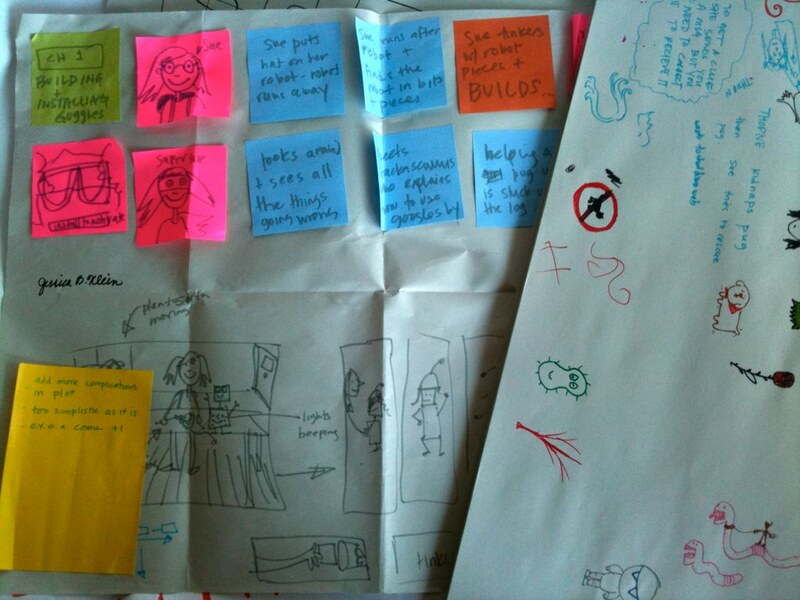 This group began paper-prototyping a hackable online comic book experience. Players would use the X-Ray Goggles to change the characters and narrative, with remixing elements in HTML and CSS built right into the story. This group designed their own game using Scratch. 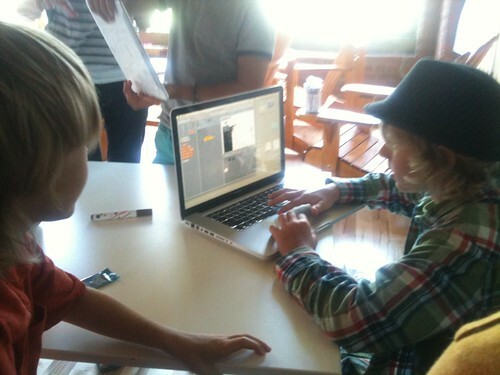 In less than 90 minutes, they were able to create their own "zombies vs. machine gun tower" game. They imagined using the X-Ray Goggles to hack leveled-up super zombies back into normal zombies. Most games have a "training mission" or two to help you figure out how to play. The X-Ray Goggles need the same. Using the "Parable of the Hackasaurus" as a prototype, Atul hacked together this quick training mission (using artwork from the kids) to help users understand how to remix images. Individual training puzzles like these could be linked together into a larger "X-Ray Goggles obstacle course" or "hacker parcours." Testing and co-designing with kids is *always* a good idea. I was worried that we weren’t ready for real kid feedback. 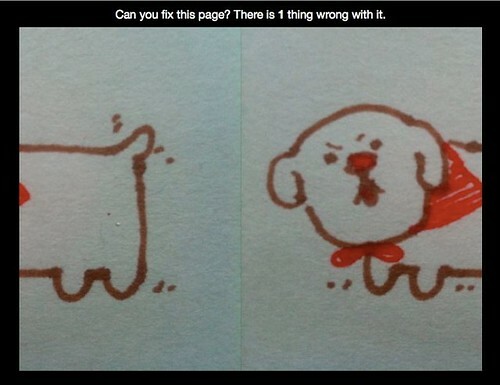 Jess helped me see that was wrong — and I’m totally sold. 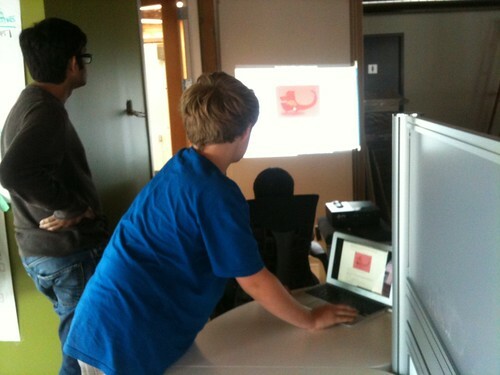 Testing with users — especially kids — is always going to yield interesting results. It’s important to really listen and ask twice. Some of the kids would give one response in a group, but then give different answers when asked individually afterward. Like anyone, they don’t want to hurt your feelings. They won’t necessarily tell you “I think your prototype is lame” right to your face. So it’s crucial to ask and re-ask in different contexts. Most kids instinctively get and speak game language. They think like game designers. To an even greater extent than anticipated. With complex concepts for character, narrative and game mechanics. Some of our stuff is skewing too young. Two 12-year-olds privately described one of our prototypes as “baby-ish” and “cheesy.” Given that we’re targeting a 10 to 15-year-old age group, this is feedback we need to take seriously, and incorporate into our re-branding efforts in Q4 / Q1. Over-earnestness or babyish-ness is the kiss of death. Portal gives you tests and progressive levels that require you to learn new skills as you go. An X-Ray Goggles "obstacle course" or set of training missions can do the same. What ideas should we incorporate going forward? 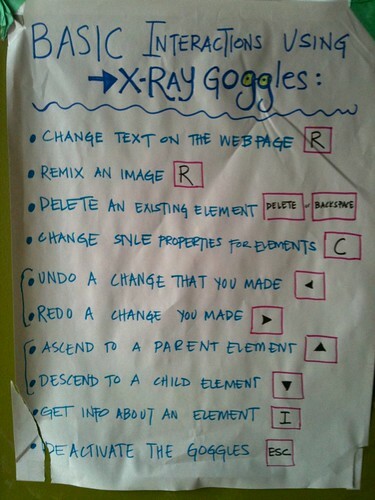 Prioritize the X-Ray Goggle training missions. We’ve added this to the Hackasaurus roadmap for beta in September. The current X-Ray Goggles page makes it easy to install the Goggles — but doesn’t help you figure out how to use them in a scaffolded, self-guided way. We need to add that next. The hackable comic book concept shows promise. Kids immediately got it, and it gave them a chance to get their hands dirty with illustrations and paper prototypes quickly. So do the Tilt 3D and “Portal for the web” concepts. Kids liked the video demo of Tilt 3D, and liked the idea of busting hacks as a way to “unlock” pages and do cool stuff to them. Unlocking super-gadgets. One of the best ideas was that busting a hack on a page would unlock a super-gadget — like a flamethrower — that you can then use to “set fire to the web page” you’re on. Or unlocking a Katamari ball you can roll around, or jackhammer you could use to bust up the page. This gives regular incentives to progress through various hack puzzles and pages — unlocking cool new web superpowers as you go. Consider avatars and characters. This was the other idea we’d never really considered — web characters or avatars that run around the page, jump through portals, etc. Hey Matt! Ever seen this? Sounds like the jam was fun! Great post, good event and great learnings. If you would like organize a session in Amsterdam, let me know! 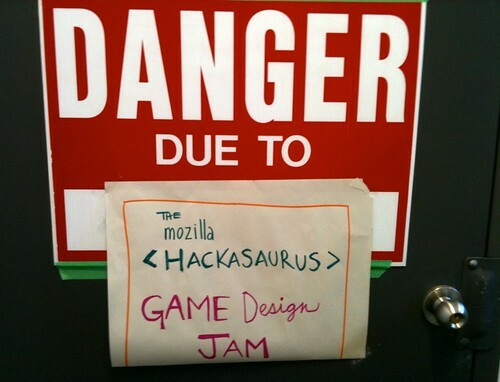 Mozilla Hackasaurus: You guys are doing amazing work. Keep on! woow..that’s very brilian games idea you share to us.